Novak Djokovic said it was good for men's tennis that the duopoly in Grand Slams had been broken on Thursday after he thumped Swiss Roger Federer to reach the Australian Open final. The Serb's 7-6, 7-5, 6-4 victory combined with Rafael Nadal's quarter-final defeat by David Ferrer means that Sunday's final will have a fresh look after 21 of the previous 23 Grand Slams were won by either the Federer or his great Spanish rival. While playing down talk of eras ending, Djokovic said there was a sniff of change in the air. 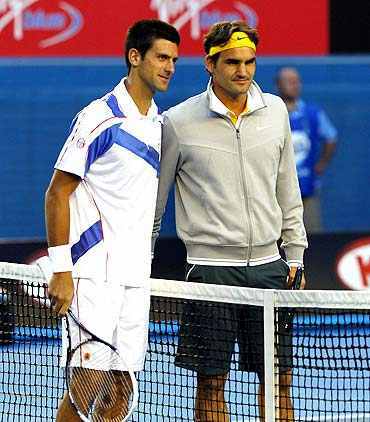 "I think on one side it's good for the sport to have more players being able to win against Federer and Nadal," Djokovic who will play Spain's Ferrer or British world number five Andy Murray for the title, told reporters. "It was really hard to challenge them, especially in the big events where they play their best tennis. "Now these things are changing a little bit, so from that perspective it's good for the sport," he added. "It's maybe early to say (there's a new era). Roger is still very much motivated to reclaim the first spot in the rankings. He's playing great. "Tonight I think I played maybe a better match, but he's still up there and in extraordinary form and he's been winning out of the last five, six tournaments he won five," he added. "You have Nadal on the other hand who has been a very, very dominant player. We are still behind them. You can't say there is a new era coming up." Djokovic certainly looks in great shape to add to his sole Grand Slam title he won in Melbourne in 2008 when he also beat Federer in the semi-final before taking out Jo Wilfried Tsonga. He said his sizzling start to the new year was partly down to the euphoria of winning the Davis Cup with Serbia -- a match that cut into his off-season but fuelled him with confidence. "Definitely it was confidence boost, and I was coming, you know, preparing for a new season with the Davis Cup title just a couple of weeks behind me," he said. "You know, to be able to have that in the back of your mind is a big advantage coming into the season, even though the fact of the matter is that I had a very short off-season. "But still, I had that motivation and confidence from the big success that we had and playing really well. So I just continued on," he added. Djokovic and his team-mates celebrated hard in the Serb capital after their country's first Davis Cup crown, but the 2008 Australian Open champion soon got back to the business of trying to break the Rafa Nadal/Federer duopoly of men's tennis. "I knew that this two weeks are the most important, this period of the year," he said. "This is where I want to play my best tennis and I was setting up my form exactly for this tournament. Paid off." The world number three has a 3-2 winning record over Federer in Grand Slam semi-finals, beating the Swiss master at the US Open last year and three years before at Melbourne Park. He said he was a wiser player than the pugnacious 20-year-old who stoked talk of a new era with his Tsonga victory but ended up spending the next three years as a support act. "Physically I'm stronger. I definitely feel like that," he said. "I was a 20-year-old kid hitting as hard as he can with closed eyes and everything was going in back then. It was great. Felt great. "I had my ups and downs throughout these two, three years, but right now I feel like I'm much stronger and more consistent and I know that I'm more stable, mentally and physically," he added.